While most of the scientific papers I’ve written have been an attempt to make a scientific point and marshal evidence that this scientific point is almost certainly true, a hypothesis paper gets to be delightfully different. My goal is not to prove the hypothesis true, but merely to suggest the hypothesis and show that it is plausible. Even coming up with a plausible explanation for colors of Kuiper belt objects is a good step; fifteen years after we first started realizing how diverse Kuiper belt colors are we still didn’t even have a plausible hypothesis on the table for explaining these colors until now. The object is to get the community of researchers studying the Kuiper belt to think about their data through the lens of this particular hypothesis and help determine whether it is right or it is wrong. I’m hoping that the answer turns out to be that the hypothesis is right, but more than that, I’m hoping that other scientists will feel challenged to try to prove it wrong. Understanding the hypothesis requires understanding much of the stuff that we’ve figured out about the Kuiper belt over the past decades. The details are like pieces of a puzzle that all have to fit together somehow. The difficulty is that you don’t know ahead of time how many puzzle pieces there are or whether or not you have them all or perhaps too many. And you don’t even know what picture the puzzle is trying to make. But you take the pieces, put them together as best you can, and try to figure out what the right outcome really is. In very very abbreviated form, the hypothesis we developed attempts to answer one simple question: why are Kuiper belt objects the colors that they are? You would think that question would have been answered sometime in the past twenty years, but every attempt that has made has been proven to be wrong. Perhaps this one will suffer the same fate. But perhaps not. My answer to the question of why Kuiper belt objects are the color that they are all hinges on the molecule methanol. All Kuiper belt objects likely start out with some amount of methanol (we infer this because all comets – many of which used to be in the Kuiper belt – are seen to have some amount of methanol in them). Kuiper belt objects which formed closer to the sun became so hot that all of the surface methanol evaporated into space (though methanol in the cold interior happily stayed). 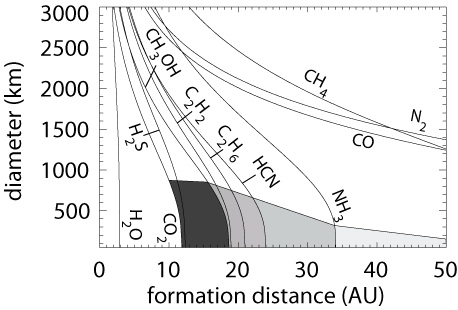 The evaporation of methanol is so sensitive to temperature that there is essentially a line in the solar system: everything outside can keep surface methanol, everything inside must lose it. Over millions of years, the surfaces of these Kuiper belt objects get bombarded from the solar wind and cosmic rays, and whatever molecules there are on the surface slowly get broken apart and remade. In general, dark complex organic molecules start to form (generally I describe these as “goo” which I think we should turn into their technical term). Laboratory experiments have shown, however, that if methanol is in the mix, the goo is unusually red. Thus, objects which formed closer to the sun and have no surface methanol have blueish non-methanol goo, while objects which formed further away have reddish methanol goo. This is the main figure from the paper. It shows the evaporation lines for major molecules (methanol is CH3OH). The evaporation lines are mostly just a function of distance from the sun, but a little bit also a function of the object's. Inside of one of the lines, all of that molecule evaporates from the surface. Outside the line, the surface still contains the molecule. The shading is an attempt to show the two major regions important for determining surface colors. It is possible that some objects which formed much further out (the "cold classical Kuiper belt objects") are also influence by the presence of ammonia (NH3) on their surfaces, but that's a story for a different day. First, no one has ever done laboratory studies of precisely the right mixes of goo to make sure that what I said above is actual true. Enough laboratory studies have been done for me to say that it is plausible. But that is not good enough. Have some nice lab equipment and looking for a project? The paper tells you precisely what we need to know. Second, most people who study the Kuiper belt believe that there are more than just two kinds of objects (the red and blue, in our hypothesis). Most people would tell you that there is a fairly uniform mix of colors from red to blue. We show in the paper, however, that this belief is actually not supported by the data. The data show that the colors of Kuiper belt objects could well be either red or blue with nothing in the middle. But the important word here is could. All we could do in our paper is show that common interpretation of the data – colors are uniform – has no statistical support. But our interpretation cannot be supported statistically, either. The data are simply not good enough. We predict, therefore, that when the right measurements are made, astronomers will find that the objects really divide into these two families. If they don’t, we’re just plain wrong. A couple of things have happened even in the last few months since we wrote the hypothesis paper that we find encouraging . First, our very large survey of colors with the Hubble Space Telescope (we call it the H/WTSOSS survey, for Hubble/WFC3 Test of Surfaces in the Outer Solar System, but mostly so that we can pronounce it hot sauce) shows quite nicely the red vs. blue distinction of the Kuiper belt. And a paper we’re working on at this very moment shows that methanol, when detected on the surfaces of Kuiper belt objects, is only detected on the reddest of objects. Neither of these proves our hypothesis right, but both give me warm feelings inside. How long will it take? I would think that the right laboratory experiments could take a few years. Acquiring more precise data for the Kuiper belt could be even longer. It’s OK. We can wait. We’ve know about the Kuiper belt for 20 years and haven’t understood the colors so far. Perhaps we won’t have to wait all that much longer. Good luck Mike. Fits the parameters of the observations well. Hope it lights a fire under everyone's chosen orthodoxy! everything outside can keep surface methanol, everything *outside* must lose it. Not at all wrong but probably not the whole story. There is also dynamics and structure of the bodies, history of collisions, etc. If you have not already, see my own take on the "Kuiper Belt of Many Colors" at http://www.nasa.gov/topics/solarsystem/sunearthsystem/main/kuiper-colors.html. Loss of ammonia (NH3) at 34 AU could be important for the cold classicals since conversion of this to nitrogen gas could otherwise drive cryovolcanism and recoat the surfaces with bluish material from the deeper pristine ice. Like birds of a feather, crazy ideas can sometimes fly together. My hope is that this is perhaps the first order effect that general sets red vs. blue and that everything else is a smaller variation. But clearly you can see exceptions such as Haumea family members and large cryo-covered things where history has had a big roll, too! Oh, talking of typos, I think the caption has inside and outside mixed up, too. I wonder to what degree New Horizons may be able to help in proving or disproving this. What color do you believe a world would be if it lies half in the red goo zone and half in the blue goo zone; do you get a purple goo world? Why do we need to look for commonalities in worlds anyway? If all worlds in the Kuiper belt were pretty much the same, then we could gather as much information about one "typical" KB world, such as Pluto and move on to other regions where there are great dissimilarities in the composition of the worlds. As an educator, I have little interest in teaching about thousands, if not tens or even hundreds of thousands of KBOs, if they are just variations of the same thing. However, for example if I were to educate students about our inner Solar system, I could take any object such as Mercury, one of the least interesting Solar system planets, and compare it with Venus, a quite interesting planet and draw the conclusion that bodies within the inner Solar system can be quite dissimilar, despite their close proximity to each other. In other words, a better question may be, "what make each KBO dissimilar to other KBOs?" If you just look for similarities, then you miss the things that make each world unique. I do not care so much about size or location for example, a world such as Titan is of much more interest to me than a world such as Mercury, Mars or Pluto, simply because their is a lot of activity and interesting features found on Titan, that you would not find on any of those other worlds. Let's not get caught up on finding all of the KBO worlds, if they are just different sizes or colors of basically the same rocky snowballs. Sure I would like to find as much as possible about distinguishing features and qualities of worlds throughout the universe, but do not want to get tangled in a web that is to find all of the limitless frozen snowballs residing in one region of our Solar system; there is a lot more to discover! Growing up in the 80's, we were supplied a steady diet of 9 planets, an asteroid belt, about 50 satellites, and a few comets swinging through every now and again deserving of note. This was the solar system. These additions to the Solar System family, coupled with the very entertaining accompanying debate on planet semantics, have fundamentally shifted my reality and rekindled a long-dormant interest in astronomy. But that's exactly what makes it so interesting. Every new discovery contributes a small little piece to an increasingly fascinating whole. Props to Mike Brown and pioneers in his field before him, who have dedicated their careers to help put this all in context. Yes, we need to discover more worlds, but only to advance science and the public understanding of the universe. Nobody needs to fulfill their ego by finding yet another KBO with features pretty much like ones with similar features already found, i.e. some may be smaller, some bigger, some may be blue, some red, however, like icebergs in the Arctic ocean, once you have seen one, you have seen them all. I am NOT saying that all KBO's are basically the same. I am saying that once you have solved the mysteries about the big issues such as do they qualify as (dwarf) planets, do they have an atmosphere, any cryovulcanism, any moons etc., then move on. Smaller issues such as (slight) color variations and shape variations should not consume our attention. Is in our best interest to use our limited resources to find and name every snowball out there if we have solved most of the big questions we had about such objects? If we discover significant differences in KBO's, then keep on looking for more KBO's with more differences; but if we find more of the same, then it may be time to move on to other areas of the universe. Now is not the best time to stop looking in the Kuiper belt, because we are finding differences in the worlds, but after a while, we will begin to find more similarities than differences in these worlds; then would be a good time to move on. Sometimes scientists (astronomers) find something initially interesting, but eventually falls into what I call "ubiquity apathy, " i.e. something may capture the publics' interest, like the discovery of Eris, but there will come a time when people just think that there are so many frozen worlds beyond Neptune that it takes something special to recapture our attention. Will lay people argue over what to name the one hundredth (or one thousandth) KBO or will names like JASB 3013, suffice? Whatever the case, I would be much more interested in the discovery of a planet between the Sun and Mercury, in the detached region, Oort cloud or outside of our Solar system, than just another of perhaps thousands, maybe millions of snowballs of various sizes, shapes and colors found in the Kuiper belt. So nine (oops, now only eight) planets are interesting but thousands of KBO ice balls are not? I'm sure that Mike considers each new body he discovers, or looks at with new spectroscopic eyes, each as as special members of his extended family, just like his own kids and those of his other family relations and so on. What attracts our general science interest are the systematics, e.g., when one group like the cold classicals are all red, or when there is bimodality of color, all either bluish or reddish but not mushed in between. In such systematic color distributions could be writ large the history of solar system formation, e.g. 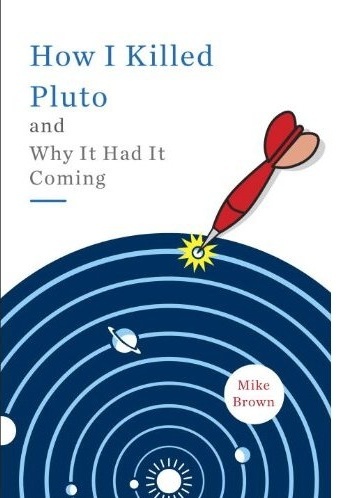 the compositional variations with distance from the Sun that Mike has now published on, and perhaps also the history of evolution by processes such as cosmic ray irradiation (dear to my own heart) since the time of formation. But the big, round KBOs are not frozen snowballs. Eris is more dense than Pluto, which means it probably is mostly rock. Eventually, we should send probes to these large KBOs and compare them with their tiny neighbors. Only then will we really have a handle on the differences between the two types of objects. If your hypothesis is right, can we deduce something about the history of these objects? Like, if it's blue and resides way out there at 95 A.U. then at one time it should have been closer, like inside the methanol line. And if it's red, it's never been inside the methanol line. Would that be so? Rogue objects might be spotted that way. The better we get classifications the better we will be able to make sense out of them.